For professionals and home-renovators seeking environment-friendly products, Canadian manufacturer Dynamic Paintware [distributed in Australia by Tenaru Timber & Finishes] has developed a range of accessories made 100% from recycled materials, including a roller made from post-consumer PET material. Without compromising professional results with all paints and enamels, the Enviro-Roller is a shed-resistant fabric cover woven from yarn originating from used soft drink bottles and other PET products. 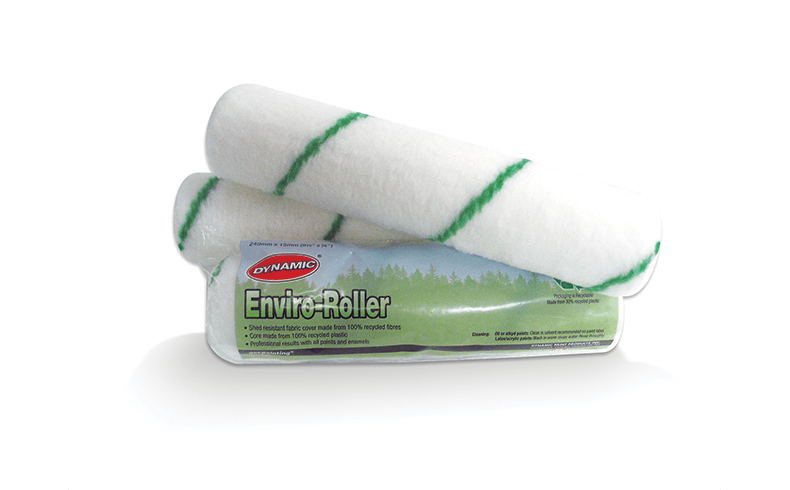 Replicating the feel of wool, the Enviro-Roller is available in various sizes. The Enviro-Paintware range also includes a paint trim cup and paint trays. Safe to use with all paints, the Paint Trim Cup features a magnetic brush holder and contoured edge to hang conveniently onto paint cans for quick and easy access. Tested by professionals to ensure the highest quality and reliability, the Dynamic range includes high quality brushes and rollers, trays, extendable poles, caulking guns, blades, scrapers and wall fillers; as well as protective wear and drop-cloths.